Can you generate entangled particles which never interacted? This post is the continuation of the last one because (1) it attracted a lot of attention and (2) no consensus was reached by the viewers. In particular, Lubos Motl was insisting on the fact that you cannot generate entangled particles which never interacted. So I am making one last attempt to convince him of the contrary. The setting is from last time: entanglement swapping. This time I will not write Latex and instead I will explain the picture above (please excuse my poor MSPaint abilities). For the sake of argument, I am using photons and I show their worldliness in black going at 45 degree angles. 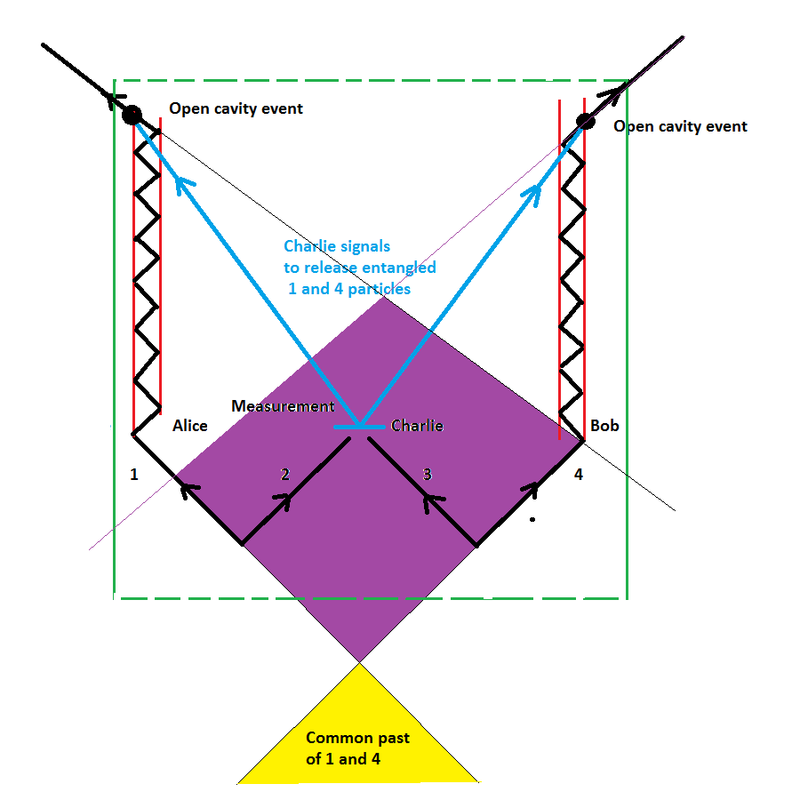 Alice and Bob have the red resonant cavities which capture the 1 and 4 photons (feel free to replace the cavities with long enough optical fiber loops). The cavities have a release or absorption mechanism which is activated by Charlie upon obtaining the result of a projective measurement on photons 2 and 3. On average Charlie obtains his desired output 25% of the time in which case he sends the signal to release the 1 and 4 photons to the outside world. The other 75% of the time Charlie sends the signal to absorb the 1 and 4 photons. From the outside Alice, Bob, Charlie, and 1 and 4 photons are inside of a green box. At random times out of the green box comes out two entangled photons which never interacted in the past. "Excellent. 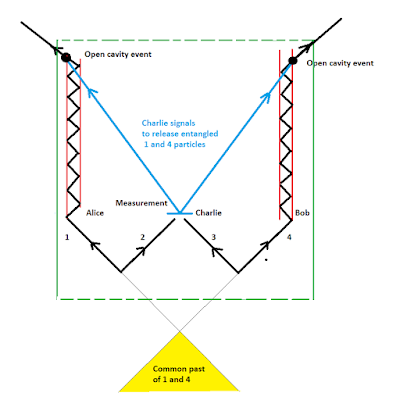 Now, the filtering is caused by the decision in Charlie's brain which is in the intersection of the two past light cones of events -measurements of particles 1,4, right? So you haven't found any counterexample to my statement, have you?" Now here is why Lubos is wrong: See the picture below. He contends it is the purple area which is important and the fact that Charlies decision is made inside it (again excuse my lack of precision drawing 45 degree lines). Why is the purple area irrelevant to the discussion? Because when the photons 1 and 4 are in their respective red cavities they do not interact with each other! Viewed from outside of the green box at random times comes out two entangled photons which never interacted in the past and could not have interacted in the past because first they were spatially separated, and second they got trapped in an isolation cavity long enough for the signal from Charlie to reach their cavity and release them. 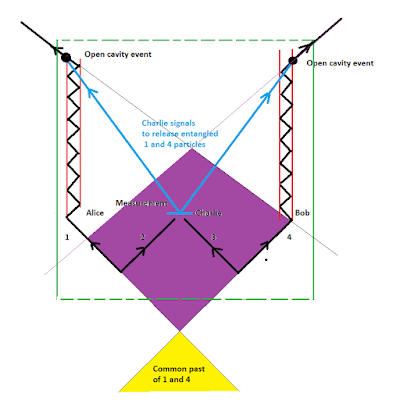 It does not matter that Charlie's brain is in the intersection of the two past light cones of events measurements of particles 1,4 at the exit of the green box (the purple area). It matters that Charlie's brain is not in the yellow area of the intersection of the two past light cones of the events of particles 1,4 entering the holding red cavities. It is hard to explain all this in words without pictures. I tried to have a crude drawing last time in the comment section but formatting mangled it. I was suspecting Lubos was only pretending not to understand my argument, but now a week after the exchange I tend think he had a genuine misunderstanding because while he was thinking of the purple area I was talking about the yellow one. ""S1 does not imply nonlocality, but nonrealism"
It does not imply non-locality for the particle that is measured, but implies non-locality for the distant particle. You measure one particle here and you create the value of the spin for both entangled particles (including the one that is far away)." "If, without in any way disturbing a system, we can predict with certainty (i.e., with probability equal to unity) the value of a physical quantity, then there exists an element of physical reality corresponding lo this physical quantity." This is a very natural criteria given a classical intuition, but it is however false. And showing why and how it is false is not a trivial matter. And if Einstein realism criteria is false then this is not true either: "you measure one particle here and you create the value of the spin for both entangled particles (including the one that is far away)." Measurement does change something about the remote particle: it's state. But if the states are related to epistemology as opposed to ontology then there is no nonlocality problem. The easiest way to understand this is in the Bayesian paradigm where I change my degrees of belief: local measurement changes my local degree of belief about the remote particle. You have just repeated all your misconceptions verbatim and 100% ignored all my essential corrections. First, in the simple case, the entanglement or correlation isn't just between 1 and 4, it's between 1, 2+3 (perhaps a joint measurement bit from 2+3), and 4. The intersection of past light cones of these three bits (pairwise) *does* contain the events that explain their entanglement/correlation, namely the two events when 1+2 and 3+4 were pair-produced. When one includes open the gates, the actual correlation between the measurements of released 1,4 has much later past light cones than you drew in yellow, and their intersection contains the actual (last) reason of the correlation, namely Charlie's decision to open or not open the gates. From the outside particles 2 and 3 are not visible. It doesn't matter whether the cause of the correlation - or any correlation - is visible. The extermination of Jews in Auschwitz was hidden behind the walls and invisible to the world, but it was still the cause of the later correlation between being Aryan/Jewish and being alive/deceased. All correlations between several variables A_i always may be explained by causes in intersection of at least 2 past light cones from the list, events at that places, and the propagation at most by the speed of light. This is the actual principle of locality or relativistic causality in Nature and it doesn't say anything about the need for something to be "visible". But if someone is using a property of the particles 2,3 to deduce correlations, properties of the particles 2,3 must clearly be visible to *him*. Your cheating is therefore just the trivial thing I have pointed out about 10 times and every person with IQ above 100 understands it very well. You are inconsistently using the perspective of someone who doesn't see particles 2,3 or their properties to argue that the correlation has nothing to do with the events involving 2,3; but you are using the perspective of someone who sees 2,3 to actually claim that the correlation exists. You can't have it in both ways. There are two different perspectives that have different probability distributions - one of them has a correlation, the other hasn't - and each perspective agrees with the principle of locality as I have stated it. By repeating your complete misunderstanding of this trivial point for weeks, you are only proving that your brain is absolutely inadequate for doing science. "you are using the perspective of someone who sees 2,3 to actually claim that the correlation exists"
This is pure nonsense. Keep generating particles 1 and 4 and do measurements on them in 2 spatially separated labs. Then compare the lab notes and observe the correlations. Knowing the inner workings (from inside or outside) I can make correlation predictions. From outside I can experimentally measure the correlations. If the particles are not released outside I can do the same thing inside as well. One can think of particles 1 and 4 as teleported states determined by Charlie. Before Charlie makes his measurement these states are not determined. The main thing that you have demonstrated is that a sufficiently complex apparatus can complexify the simple notion of photon entanglement so that two or any number of very smart quantumologists can argue endlessly about entanglement. You might consider returning to the single photon, source and observer with a single beamsplitter. A single photon represents a bonding state between a source and observer and multiple paths affect the quantum nature of that bond. As I understand, even you can generate entangled particles which never interacted (what you said), you cannot generate entangled particles without prior interactions (what Lubos said). Entanglement does not come out of nothing. However you do not need to have direct interaction and I was pointing out Lubos' overreaching statement. He has many more other instances where he paints the picture with too broad a brush and does not pay enough attention to details. Dear Florin, particles 1 and 4 didn't interact directly, but the correlation between 1 and 4 and nothing else is correspondingly not the correlation that actually exists. The correlation that actually exists is one between three bit-like variables, 1, 2 XOR 3, and 4. These three *did* have direct interactions. 1 and 2 XOR 3 interacted directly when the 1-2 pair was created, and 2 XOR 3 and 4 interacted directly when the 3-4 pair was created. So there is nothing "overarching" about "my" statement. It's not mine. It's *the* principle of locality that you should have understood before you passed your special relativity undergraduate course. It is you who is being sloppy all the time and inserting mistakes and omissions at every other place. I am perfectionist and avoid all these mistakes, especially if they would matter for some big conclusions. Incidentally, your talk about 4 particles and entanglement swapping is completely redundant if you only want to exploit your fallacy of neglecting 2+3 to argue that there is remote action. You could make the argument just with the simple 2 entangled particles 1,2. They're generated by a source, and fly to places A,B. A measures 1 to be up, so he knows 2 to be down. You may immediately forget that the spin of 1 was uncertain and could have come out in both ways - just like you are forgetting about the 2 possible values of the joint 2+3 measurement in the swapping case. If you forget that this bit wasn't known to start with, you may take the perspective of A and say that the spin up of 1 is a "fact", erase this variable from probabilistic distributions, and just claim that particle 2 has the spin down, because you know it to be the case. In this case, you have created a remote particle with the desired spin - you acted at a distance, without the cause in the past light cone. The mistake of this claim is exactly the same as the mistake you keep on repeating in this unnecessarily redundant situation. The point is that the spin of 1 wasn't determined so you can't erase it from considerations of correlations. The observer A couldn't have "ordered" particle 1 to "show itself" as up or down - it was up to the particle's or Nature's random quantum generator. And the existence of this random generator doesn't mean that other random numbers can't be correlated. Indeed, the perfect entanglement guarantees that the spin of 2 is measured to be exactly the opposite. So in this case, it is spectacularly clear that A didn't exert any remote action on particle 2. The actual cause of the 1-2 correlation was the common production of the entangled pair in the source. It's exactly the same in the swapping case. The actual cause of the 1-4 correlation wasn't some mysterious action at a distance without causes in the past light cones. The actual cause of the correlation that always holds - correlation that must be formulated as a correlation between 1, 2 XOR 3, 4, otherwise it simply doesn't hold or exist - is the triplet of the relevant events: the emission of a pair 1+2 by one source, 3+4 by another source, and the joint measurement of 2+3. These are the actual causes and all the correlations between the relevant objects only appear in the intersections of future light cones of these events exactly as dictated by locality. Lubos, you cannot rewrite history. You cannot claim you said PBR is a good theorem, or that quantum correlations are not like the socks, or that QM is nonlocal, or that correlations do not require direct interaction. You repeated the idea that correlations require direct interaction too many times and in too many contexts to pedal back now. When we measure two entangled particles, the measurement systems become entangled too. It is obvious that they do not become entangled by direct interaction between them. Florin's demonstration of nonlocality is similar to Lucien Hardy's proof of nonlocality. Hardy illustrated much the same in his 1993 PRL paper. Lawrence, first I did not prove anything remotely new, I simply worked out in detail what is usually given as a homework problem in quantum information classes. Second, Hardy's proof is different and to compare it with this silly little problem diminishes the importance of Hardy's result. Third, what I explained has a very nice and neat explanation in the pictorial formalism of QM. The main difference is that Hardy's proof is probabilistic and more rigorous. Your demonstration I think connects with Hardy's with the outcomes of particle 2 and 3 that Charlie communicates. As a result the particles 1 and 4 appear randomly.